My poha berry bush has become gigantic, sprawling out of its pot and spreading across the lawn. The chickens have been chewing on leaves that they can barely reach, the ones that dangle invitingly into their territory. 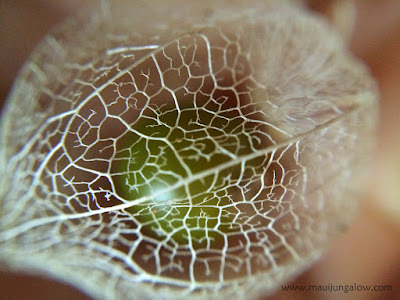 Poha berries seem to be related to Chinese lanterns or tomatillo plants – all plants with delightful wrappers. They are small and tart with tiny seeds. Our friend down the street says that poha plants grow wild in some parts of the Big Island. Here on Maui, I don’t know any place where they grow wild. I have to actually fertilize our plants, and after my husband cleaned the gutter, I dumped all the rotting leaves onto the poha plant which bloomed and fruited like crazy. The berries are naturally protected inside a leafy lantern-shaped sheath or covering so fruit flies and other bugs can’t get to them, or somehow don’t notice them. The ripe and older fruits fall down, hidden under layers of leaves. 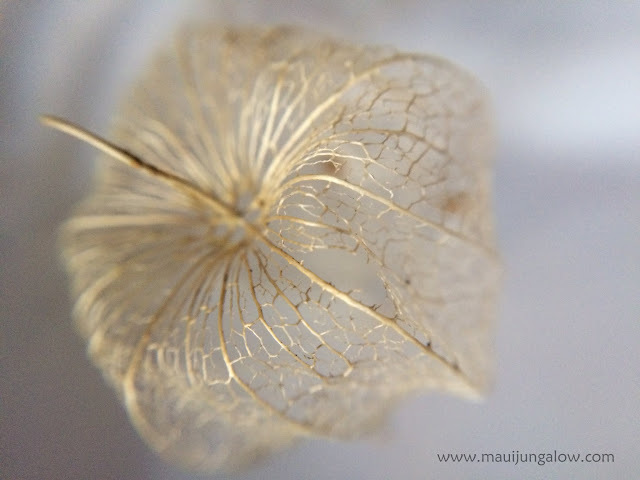 Over time, if not discovered, they turn into filigree fairy lanterns like this one. 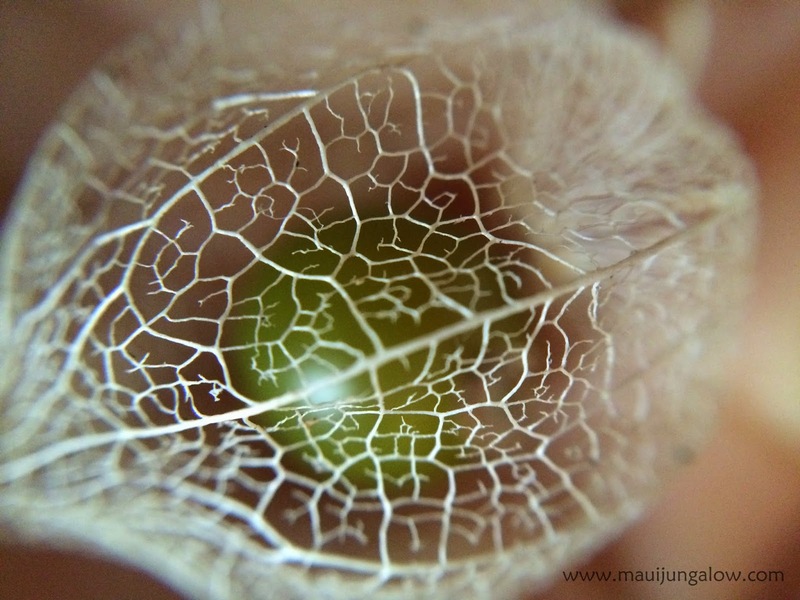 Normally, the calyx or sheath is green and opaque, but time has worn off the green, leaving a leaf skeleton behind. The berry also fell out, or was eaten by ants. 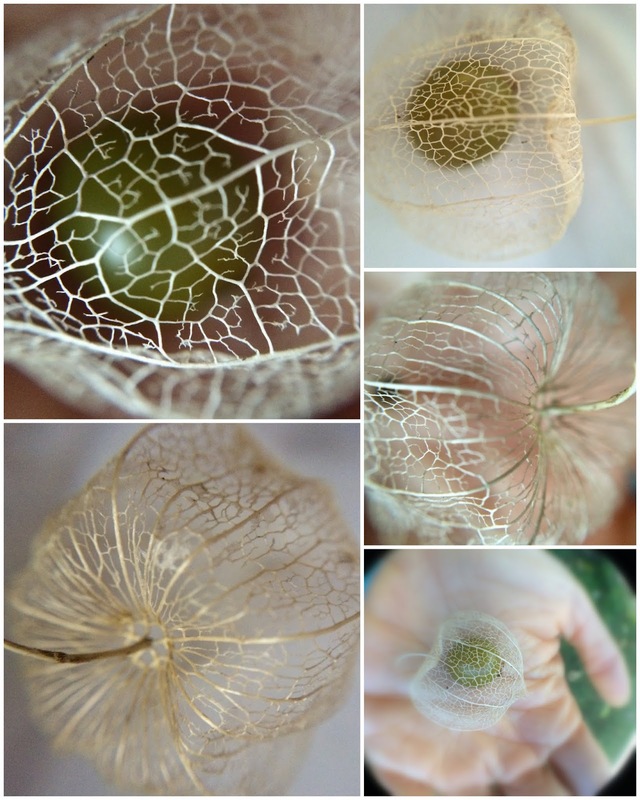 Lacy wrappers - like leaf skeletons. January has been unexpectedly sunny and hot for Haiku, which is supposed to be the cool, rainy side of Maui. For nearly six weeks, we’ve had hardly any rain, and days which are so blindingly bright and hot, like summer weather. Drought weather. Maui County is concerned that we'll have wildfires this summer - like California. My plants have been keeling over for lack of water, which is shocking in Haiku. So I’ve been hand watering the plants, the chickens, the cat. The cat doesn’t appreciate it. The weather has been so warm and inviting, who wants to sit inside and work (much less blog)? The normal problems with mold and mildew (like on my husband’s motorcycle boots) have been nonexistent. Then, two days ago, the sky opened up and we got our normal winter weather, complete with muddy lawn and feet, overcast sky, and a night time temperature of 63 Fahrenheit. Yeah, baby it’s cold outside! Yeah, we’re such wusses here.